Kiev is the capital of Ukraine and with almost thgree million people it is also the largest. It is located in the central north of the country along the Dnipro River. The city (and the country in general) have become more popular during the last years and it is not difficult to see why when you just walk around this impressive city. On the one hand, there are the typical wide six-lane boulevards with massive buildings alongside and monuments for everything and everyone, on the other hand it has some beautiful Orthodox churches like Sophia Cathedral. The Monastery of the Caves is another highlight places on the UNESCO World Heritage List. 'Maidan', or Independence Square and Khreshchatyk Street are the heart of the city where you will find good food and excellent nightlife as well. The welcome mix of new and old makes this city a place to spend a few days before exploring the rest of the country. The Ukrainians believe that Kiev has a very special atmosphere and the fastest city rhythm in Ukraine. Sophia Cathedral - Original, 13th century cathedral modelled on Aya Sophia in Istanbul. Sophia Cathedral is the main Christian shrine in Kiev. Sophia means Lord’s Wisdom. It’s a part of Sophia State Reserve. The state reserve is on the UNESCO World Heritage list. Kiev Prince Yaroslav the Wise began the construction of this cathedral on 1037. Prince Yaroslav the Wise did a lot to make Kiev the Second Constantinople. The Golden Gate is also legacy of Prince Yaroslav. The Lavra caves are the place of pilgrimage for Ukrainian Orthodox followers. It is a large complex of parks, churches and caves, including underground chapels and corridors lined with the preserved bodies of priests in glass coffins. Holy Assumption Laura of the Caves is the full name of the monastery complex. The ancient caves are from five to twenty meters deep under the surface. There are Far Caves and Near Caves, both of them have three cave churches. The caves are famous for their holy remains. There are tombs of dozens of saints – over fifty - in those caves. In this respect they are a unique Christian sanctuary. Do not wear shorts; women must cover their head and cannot wear trousers - you can hire coverings and skirts there, but expect to queue to do so. The caves are free, but entry to the complex requires tickets. Andreyvskiy Spusk - St.Andrew's Descent is a traditionally Bohemian street in the north part of the centre of Kiev containing bric-a-brac and souvenir stalls and several small, fascinating museums. The Museum of Folk Art and Architecture - located in a village 40 minutes south of Kiev (at the end of the line of local bus 156) contains traditional houses, windmills etc. saved from all around the country. Kiev Day is one of the main events of the year, with concerts, fireworks, and lots of celebrations in the streets of the capital. It takes place during the last weekend of May, with drinks on Friday night, fun in the street on Saturday and fireworks on Sunday. Many areas light up, with Khreschatyk Street and the two main squares—Independence Square and European Square—quite festive for the occasion. The Summer Music Festival in Kiev is one of many musical-oriented events in the Ukraine. It features a string of open-air concerts on weekends late May through the middle of July at the Central Park of Culture and Resort. There’s everything from classic and modern performances to jazz. Locally known as Kraina Mriy, this popular summer event of folk music late June/early July takes a look at Ukrainian culture. The event features several stages set up in a large park to the east of downtown Kiev, with views of the Motherland Statue. Visitors enjoy a variety of tunes, as well as a kiddie section called Child’s Meadow. It’s easy to get to on the Metro from Arsenal’na station. The Molodist International Film Festival is a long running event in Kiev the last week in October, with films from all corners of the globe being showcased. Popular in the world of moviemaking, it’s best to buy tickets online because this event does sell out. Kiev is cold and dismal between November and April. The best time to visit is in the summer months when the weather is generally warm and sunny with temperatures averaging 25 °C during the day from June to August. Highs of 35 °C have been recorded though, as well as winternights way below -20 °C. Precipitation is fairly even throughout the year, with some more rain in summer though and snowfall in during winter. Boryspil International Airport (KBP) near the capital is the base of Ukraine International Airlines, the national airline of Ukraine. International destinations of the airline include Amsterdam, Barcelona, Berlin, Brussels, Dubai, Frankfurt, Helsinki, Kuwait, Lisbon, London, Manchester, Madrid, Milan, Paris, Rome, Tbilisi, Vienna and Zürich. Several dozen other airlines serve Kiev as well, mainly from European cities and former Soviet Union Republics. Boryspil Airport has 3 terminals in operation: B, D, and F. Most international flights arrive in the terminals D or F, whereas terminal B is used for domestic flights. Terminal B is much older than F. Both terminal B and F are very cramped and inconvenient, while terminal D is newer and larger. Expect long queues at the immigration control, which is inevitably haphazard. Despite separate lanes for Ukraine citizens, 'non-visa', and 'visa' passengers, few booths are usually in operation so getting through immigration can take over 30 minutes. The simplest way to get to the city centre from Boryspil (KBP) is the Sky Bus - Shuttle, which operates a regular bus service between the airport and Central Railway station (South terminal). Buses depart every 15 minutes during rush hour, or every 45 minutes in the middle of the night, 24 hours per day, and the cost is 40 UAH (4€). The journey to the city center takes 40 to 70 minutes. The buses stop in the front of every terminal. Buses terminate at the southern side of the railway station. To get to the subway from the bus stop, enter the railway terminal, follow the bridge over the railway, leave the building, and turn left. For taxis, the minimum price to the city center is about 300 UAH when you book in advance. Unofficial cabs may demand higher prices, so always arrange the price before you enter the cab and feel free to bargain. Several bus and minibus lines serve the airport, connecting it to the closest stations of the Syretsko-Pecherska Line Syretsko-Pecherska Line and the central railway station. Many intercity bus routes to or from Kiev make dedicated stopover at the airport to cater for airline passengers from other cities. E.g., a Kiev-Donetsk (southeast-bound) bus would travel from Kiev Central Bus Station through the airport, while a Kiev-Lviv (southwest-bound) bus would start in the airport and then proceed to Lviv through the Central Bus Station in Kiev. Overall, at least 35 intercity bus routes transit Boryspil Airport. All long-distance and Kiev-bound buses arrive to the airport's bus station located near the "B" terminal. Kyiv Zhuliany International Airport (IEV) is located 4 kilometres southwest of the center city. It is mostly served by budget airlines. Some of the main destinations include Athens, Moscow, Dubai, Dortmund, Sofia, Vilnius and Valencia. From Kyiv (IEV) you can use Kiev's public transport to reach your accommodation or the train station. There are two terminals -they are around 1 kilometer away of each other. They're connected by trolleybus no. 8, that takes you further to downtown. Kiev Central Railway station is located near the city centre. In Kiev, there are several other railway stations, but it is unlikely you will need to go there.All passenger trains in Ukraine and to other countries depart from the central railway station (subway st. Vokzalna). The central railway station is the city transport terminal which consists of suburban train station and the south terminal, which is a new part of the central terminal. To the South Railway Station you can use the Skybus (see above). Roads in Ukraine are upgraded all the time and relatively good roads connect Kiev with Odessa south and west towards Poland. The central bus station is located in Kiev at the Moscow sq, 3 (phone: +38(044) 527-9986, (044) 525-5774). Schedule to the central bus station in Ukraine and international buses can be found online. Bus station "Darnitsa" Str. Yuri Gagarin, 1, phone: (044) 559-4618. Schedule online. Bus station "Dachna", Blvd. Peremogy, d.142, Phone: (044) 424-1503. Schedule. The schedule of buses at bus stations in Ukraine can be found online. The new bus station "Kiev" is at Railway Station Square, 1 (near Central railway Station). Departure of buses on intercity and international routes. It's possible to organize trips down the River Dnieper to the Black Sea in summer. A travel agency in Ukraine can book these trips for you. The Metro (Ukrainian: Метро) is one of the pleasures of Kiev. It is a clean and fast subway system and it is easy to navigate once you realize that all three metro lines (red, blue and green) go through the city centre. In total there are 50 stations, with ambitious plans for extension. When you enter the Metro, you must purchase an entrance token from the cash desk, Kasa (Ukrainian: каса) or from a special ticket machine. One token is valid for one trip, no matter how far you go. A token is UAH4 and one needs to slip the token into the turnstile to enter. A note of caution: make sure you walk through the correct side of the turnstile (that's usually on the left side of the turnstile you slip your token in), or you will be hit with a metal gate that will slam shut. You can also obtain an unlimited monthly ticket with a magnetic tape, which is available for sale for UAH95 during the first week of the calendar month or the third week for half the price (but not strictly so). As of 2012, the Kiev metro has undergone a major improvement with respect to the navigation. Most maps and signposts are translated into English. Additionally, every stations has got its unique three-digit number, with the first digit showing the number of line (M1 for red, M2 for blue, and M3 for green). Once on board, every station is announced by loud speakers and TV screens. These screens show a lot of weird ads between the stations, but flag an impending station before arrival. Upon departure, they then show the next station. Trains run every 30 to 150 seconds during business hours, every 5 minutes after 20:00, and every 10–15 minutes after 22.30. Last trains depart from the terminal stations around midnight, so your last chance to catch a train in the city centre is between 00.15 and 00.25 (check the timetable of late departures, which is signposted on each station). Trains are often very crowded. Be prepared to push, as this may be the only way you get on the train during peak hours. It's interesting to note that the Kiev metro has some of the deepest stations in the world. The Arsenalna station (Ukrainian: Арсенальна) station is the deepest metro station in the world, at 107m deep, and the Universytet station (Ukrainian: Університет) has one of the longest escalators (87m long). Many stations have two long and intimidating escalators in a row. There are two types of city-run buses available - bus (автобус) and trolleybus (тролейбус) - as well as slow and moribund trams. These can be hailed from assigned stops, which are marked by an inconspicuous sign on a telegraph pole. The buses are often very crowded during peak hours, but the norm is to push your way in. Once on board, you need to get a ticket and validate it by punching a hole with one of the small punchers that are attached to the posts inside the bus. If you can't get near the hole puncher, ask someone to validate your ticket for you. Tickets cost UAH3 and are normally available from a conductor on board (oddly enough, they first sell you as many tickets as you want, then asks you to validate one). Tickets can be also purchased from drivers or in kiosks throughout the city. Central Kiev and the main sites can be reached by foot. The Caves Monastery requires using public transport (or a much longer walk) - take the metro to Arsenalna and follow the main road east/southeast. Kiev is not a good city for cycling around. In general, it is very cheap to dine in Kiev by European or US standards. So long as you stay away from the places that totally pander to tourists or to the Porsche Cayenne-driving "elite", the food is great and cheap. Try the Borscht and the Mlyntzi and then try absolutely everything else. Baked goods are cheap and great too. Even the ice-cream on the street is great. Try, for example, the one to the right from Khreshchatyk metro exit - blue kiosk with varying length of queues. When you see vendors selling some liquid from big yellow/blue tanks on the street, you can be sure that it is "Kvas," which is a brewed bread drink. Some people like it and others hate it. It tastes a bit like malt, and the alcohol content is so low (0.05-1.44%) that it is considered acceptable for consumption by children. Try "Odyn Malenkyi" (one small) drink. You should not drink the tap water (for reasons both chemical and microbial). It is advisable to buy bottles in the supermarkets; they usually have English section on the label for "ingredients". You can always order "Bonaqua" (a brand of sparkling mineral water), but beer is just about as cheap. There are several nice places in Kiev to get a drink. From small cafés that are only frequented by locals (they look dirty at first sight) to expensive places. Locals often buy drinks (beer) at a stall in the street and drink it in a park, leaving their bottles for the homeless to collect and cash in. However, since 2011, drinking beer in the street is prohibited and whilst you will see locals drinking in the street, you will make yourself an easy target for the police to stop and try for a bribe if you do. Locals often buy some chips or other salted things to go with their drinks. The prices are quite reasonable by European standards. You will easily find decent Ukrainian beer for 20UAH–30 and get 5cL of vodka or similar alcohol for about UAH20. Depending on the location of the hotel prices are variable. You can view prices for the central hostel at [http://www.hostel.kiev.ua|their website]]. The hostel is located near Khreschatyk Street and Golden Gate monument. Five-star hotels cost US$300 a night or more. Hotel Turist on the East bank: Kiev's biggest hotel; 27 floors, you might be lucky and get a good view back towards the city centre. Price includes breakfast (unusual in Ukraine). Foreigners can sometimes find work teaching their native language. Pay is usually decent enough to live on in Kiev if you get enough pupils and live by local standards. As is the nature in a global economy, professionals with skills in demand, e.g. accountants and IT professionals, can be employed with global firms in Kiev, without knowledge of Russian or Ukrainian languages. Internet develops quickly in Ukraine, and therefore, today it is no problem to get access to the world wide web - both wired and wireless. There are more access points in big cities, nevertheless there are also some in small settlements. The majority of Ukrainian hostels and hotels of different level have Wi-Fi points, which allow visitors to use high-speed Internet. Most Ukrainian restaurants and many cafes are equipped with internet access points, there are also Wi-Fi zones in terminals of the international airports. You may also access Internet from your cell phone, if your device supports GPRS or one of the 3G standards. All cellular carriers in Ukraine offer access to the mobile internet. Moreover, it's usually no problem to find Internet-cafe in Ukrainian cities. "Ukrtelecom" company offers Internet access as well. Its offices are easy to find in any town of Ukraine. The cost of one hour of Internet access usually doesn't exceed €1-2. The international phone code for Ukraine is 380. The general emergency phone number is 112 and there are special ones for fire -(101), police (102), ambulance (103) and even gas leaks (104). Although cell phones are becoming more and more popular, a lot of people still use phonecards and this might be a good and cheaper option for travellers as well. If you are here for any length of time it is worth investing in a local sim-card for your mobile. No major international mobile operators exist in Ukraine (yet) so if you have Vodaphone or T-mobile (etc) your phone may not work here. Kyivstar and MTS are the biggest Ukrainian operators. Ukraine Poshta is the national postal service of Ukraine (website is rather slow and not always working). Unfortunately, the postal service in Ukraine is unreliable or at least inefficient and slow. Most packages get stolen or searched for things that can be sold. Post offices exist in all cities and towns and postcards can be sent quite safely, but the service may be slow. Like many other businesses, post offices are open from around 9:00am to 6:00pm with a lunchbreak between 1:00pm and 2:00pm, though opening times may vary. Smaller ones in rural towns keep shorter hours, while the largest ones in Kiev are usually open very late, during weekends or even 24 hours! If you want to send a letter or postcard and buy stamps, just queue up at the line where you see envelops and cards. Be prepared to wait a while, also regarding the time it takes to send a postcard to Europe (a week) or the USA (two weeks), let alone places further afield. Always send letters by airmail (avia in Ukrainian). For faster (but more expensive) sendings of parcels, try companies like TNT, DHL, UPS or FedEx. 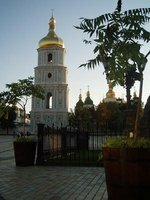 We have a comprehensive list of accommodation in Kiev searchable right here on Travellerspoint. You can use our map to quickly compare budget, mid-range or top of the range accommodation in Kiev and areas nearby. This is version 52. Last edited at 8:43 on Jan 9, 19 by Utrecht. 71 articles link to this page.